This set is temporarily on Back Order. Please check back again soon! Please call about other color options. Your kids' imaginations will run wild when they're playing on the Congo Monkey Playsystem IV. 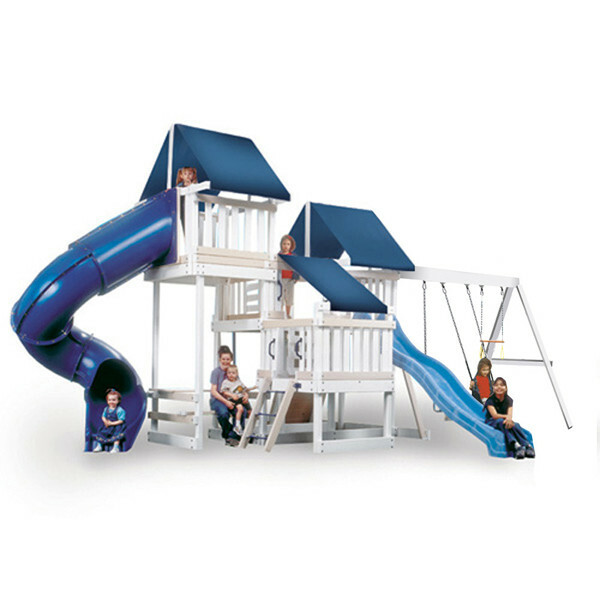 This premium swing set features 3 levels of play including a sun deck, 4' by 7' play fort, and a turbo tower that can be departed via the twisty turbo slide. Kids can also find the ground again using the fun fireman's pole or the wonder wave slide. For high-flying fun this playsystem has a swing beam that facilitates 2 belt swings and a trapeze bar. You'll also find a cool 5' rock climbing wall. 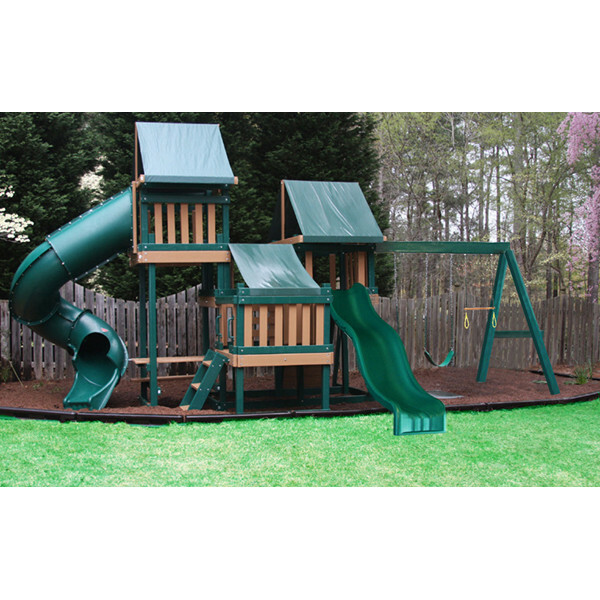 Once you order this high quality playset you will have all of the lumber, hardware, and parts needed and ready to assemble. Lumber is all pre-drilled and pre-cut, covered with a protective polymer coating that resists damage from the sun and other elements. It is 100% splinter free for safety to your kids and extremely low maintenance for you. Once you place your order items will ship in less than a week. Most products are sent from our warehouse and corporate offices in Atlanta, GA so shipping time can vary depending on your location. Orders being sent to Canada, Alaska, or remote regions of the US may be subject to longer shipping times and additional charges above our flat rate shipping. If this is the case you will be notified of these charges before shipment with the option to cancel your order. International customers will need to contact us with their shipping information and products they are interested in to determine shipping charges and times. Large items will be delivered via a freight trucking company. The freight company will contact you when they receive your order to schedule a delivery appointment. You must be present to accept your order. Delivery is curbside and products cannot be moved into your home or garage. Please inspect your items upon delivery for damages. Any visible damages much be noted on the delivery receipt in order to make them eligible for damage claims. 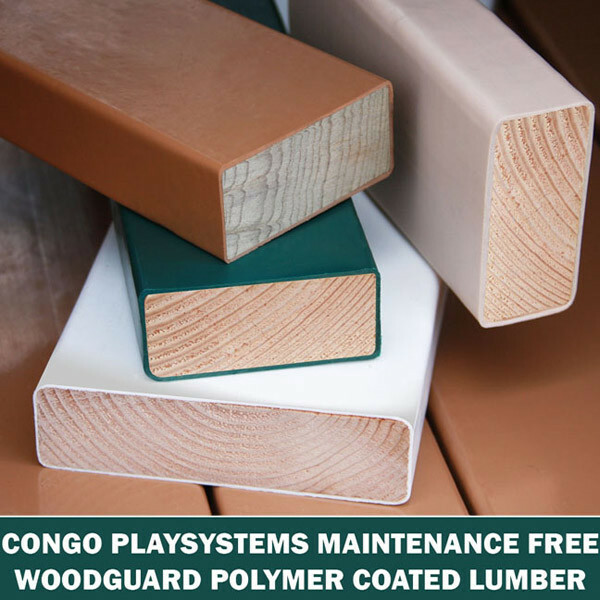 Your playset comes with a 10 year warranty that covers all Woodguard lumber. Other non-wooden parts such as hardware, roped or chained accessories, slides, plastic and metal parts, and canopies or tarps are covered by a one-year warranty against manufacturer's defects. Any defects or damages that are reported within 30 days will be replaced with no charge to you. After 30 days you will be responsible for any shipping charges that are required for warranty replacement items. 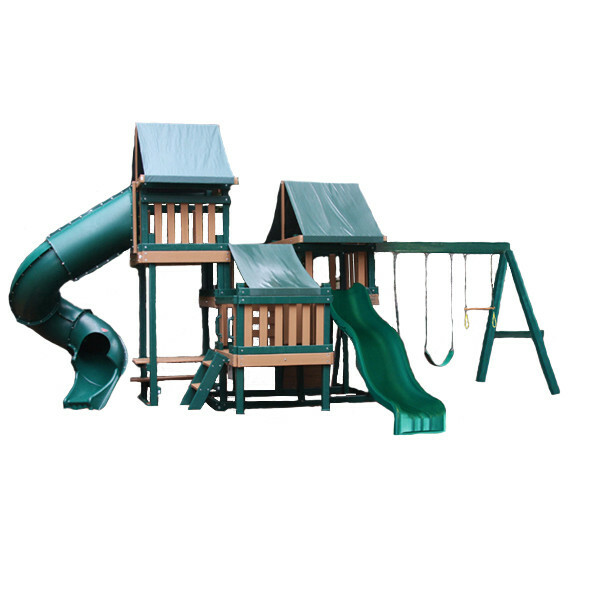 Our playsets are intended for residential use only. Any damages that occur as a result of commercial, rental, or public use will not be covered by the 10 year or 1 warranty. Please contact us for replacement or warranty information if you discover any damaged or defective parts. Congo prides themselves in offering a fun and quality line of outdoor products that are designed to be fun for kids while being maintenance free for parents. 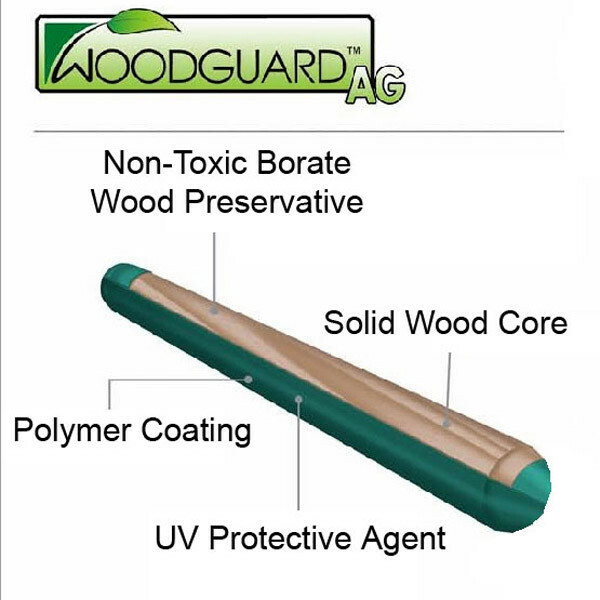 They use high quality Woodguard-coated lumber that is covered with an easy to care for polymer coating. This coating is made from recycled plastic and will stand up to outdoor elements with close to no required care. Every playset is loaded with fun features and comes to your door pre-packaged and ready to assemble. All hardware is included along with pre-cut and pre-drilled lumber and step-by-step instructions.